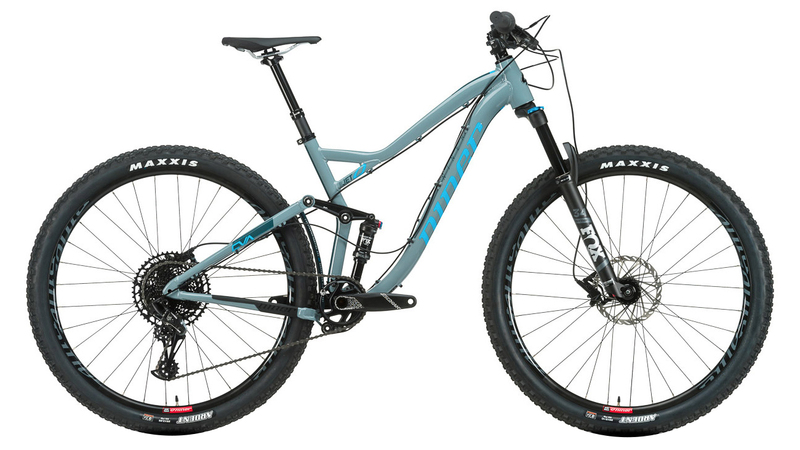 Though 29ers originally debuted as cross-country bikes, Niner has taken the big wheeled bike and made it into a versatile, high performance trail machine. Capitalizing on the rolling efficiency of the 29" wheel, Niner designed the JET 9 to be more than just an efficient climber by using their patented CVA suspension technology and their trail proven geometry. The result is a 29" bike that is not only XC-capable but is also nimble enough to handle the endless rock sections, drops, and even the occasional jumps that can be found on most trails. The Jet 9 features the same geometry and handling characteristics as the race-specific Jet 9 RDO and blends it with SRAMS's popular and economical NX Eagle drivetrain to deliver a formidable blend of simplicity and functionality. The JET 9 frame is made from Niner's beautifully shaped and finished, highly durable alloy. The front end suspension is kept in the hands of Fox with a Float Rhythm 34 130mm fork with a 15mm axle, while the rear suspension is provided by a Fox Float DPS Performance shock to deliver 120mm of smooth, yet responsive travel. The JET 9 1 Star NX1 bike comes with the NX Eagle trigger shifter letting you play with the 12 speed 11-50 tooth cassette, while the SRAM Level hydraulic disc brakes will have you comfortably stopping on demand. The JET 9 NX1 is rounded off with a SRAM Descendent crankset that powers Niner alloy wheels wrapped with Maxxis rubber. So whether you want to hang with the cross-country crowd or crave a rugged adventure, this well-equipped JET 9 is trail bound and down.